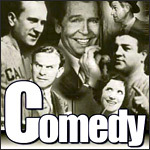 A spin-off of the comedy series Fibber McGee and Molly, The Beulah show revolved around the life of a middle-aged African-American maid. The character of Beulah, created and first played by white man Marlin Hurt, was eventually taken over by Academy Award winning actress Hattie McDaniel. The self-pronounced "Queen of the kitchen" worked for the Henderson family: Harry, Alice and their 10-year-old son, Donnie. Beulah’s boyfriend, Bill Jackson, and the neighbor’s maid, Oriole, were often on the scene as well. Although sometimes misguided, the feisty Beulah was a hard worker and a caring woman who did her best to help those around her in any way that she could...often with hilarious results.